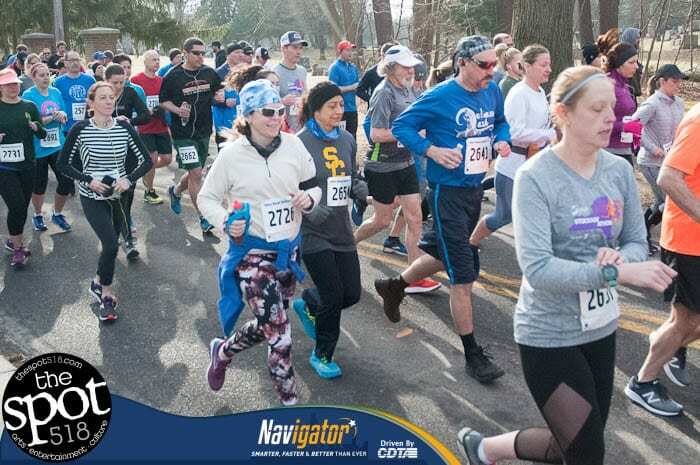 DELMAR – Early morning clouds gave way to a bright spring sun as local runners gathered for the 2019 Delmar Dash on Sunday, April 7. Jonathan Lindenhaue, 31, of Albany, bested a field of 232 runners with a time of 25:29 in the annual five-mile race. Bennington, Vermont resident Tim Van Orden, 50, finished second (27:28). Thomas O’Grady, 33, of Slingerlands, finished third (27:33). Rylee Davis, 13, of Delmar, led all women with a time of 33:41. She was followed by Albany resident Jennifer Richardson, 38, with a time of 35:29. Judy Guzzo, 50, of Niskayuna, finished third with a time of 35:34. Three octogenarians finished this year’s dash. Among them, Rensselaer’s Anny Stockman, 86, finished at 1:08.39, followed by 81-year-old Eiko Bogue (1:10:56) and 80-year-old James McGuinness (1:02:04). At 10 years old, Slingerland’s Olivia Deer was the youngest competitor in the race. She finished with a time of 52:20.